New Rochelle, NY, November 7, 2018–There are known racial and ethnic disparities in death due to traumatic brain injury (TBI) and a new study has now examined if there is an association between TBI mortality and where a U.S. veteran lives. The study showed that, among veterans with TBI, mortality was higher for those living in the U.S. territories compared to the mainland, as reported in an article published in Health Equity, a new peer-reviewed open access journal from Mary Ann Liebert, Inc., publishers. Click here to read the full-text article free on the Health Equity website. The article entitled "Geographic Disparities in Mortality Risk within a Racially Diverse Sample of US Veterans with Traumatic Brain Injury" was coauthored by Clara Dismuke-Greer, PhD and colleagues from Ralph H. Johnson Department of Veterans Affairs Medical Center (Charleston, SC), Medical University of South Carolina (Charleston), University of Utah School of Medicine (Salt Lake City), Medical College of Wisconsin (Milwaukee), US Department of Veterans Affairs (Washington, DC), and Health Management Associates (Washington, DC). The previously documented higher TBI mortality among Hispanic veterans appears to be linked to living in the U.S. territories. The researchers of this study raised concerns about potential differences in healthcare quality between the U.S. mainland and U.S. territories. "Too often, veterans are clustered as one large group. Although there are a number of issues that are cross cutting and important to all veterans, it is equally important to recognize the health experiences and, in this case, adverse outcomes that might exist for subgroups. In addition to awareness, this work highlights the need for innovation and outreach to achieve improved health in a group for whom we have a covenant of care because of their bravery and service." says Health Equity Editor-in-Chief Ana E. Núñez, MD, Associate Dean of Diversity, Equity & Inclusion and Professor of Medicine, Drexel University School of Medicine, Philadelphia, PA.
Health Equity is the new peer-reviewed open access journal that meets the urgent need for authoritative information about health disparities and health equity among vulnerable populations. With coverage ranging from translational research to prevention, diagnosis, treatment, and management of disease and illness, the Journal serves as a primary resource for organizations and individuals who serve these populations at the community, state, regional, tribal, and national levels. 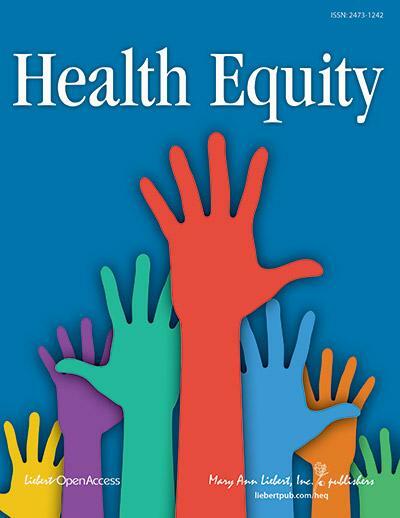 Health Equity is supported by a generous grant from the W.K. Kellogg Foundation to ensure that it is accessible as widely as possible and to provide a framework for achieving health equity for children, families, and communities by reducing and ultimately eliminating disparities in health and their social, economic, and environmental determinants.